The Shropshire Association covers the towers in the Salop Archdeaconry of the Lichfield Diocese, and is roughly the area north of the River Severn, from near Wolverhampton in the southeast to Selattyn in the northwest. The rest of Shropshire is in the Hereford Diocese. If you would like to know more about bellringing click here www.cccbr.org.uk/what-is-bell-ringing/. If you like to learn to ring please contact our secretary [ ], or go along to a tower near you on a practice night. Information about the towers in the Association, practice nights and Association events, and much else, can be found by following the links on the left or below. The Association Surprise Major practice, due to be held on Friday 26th April at Meole Brace, has been cancelled. The next Association Training morning will be held at Edgmond on Saturday 27th April from 9:30am to 12:30pm. The number of students is limited; please contact Tony Freemont  if you would like to attend. The cost is £5 per student. These were held at St Martins, with twenty one ringers attending. Matt Lawrence, Ringing Master, was able to persuade those present to have a go at ringing Plain Bob Doubles, Grandsire Doubles, Plain Bob Minor, Cambridge Surprise Minor, Cambridge/Beverley/Surfleet Surprise Minor, and Dixon’s Bob Minor. The quarterly meeting was held in the church hall, where hot drinks and biscuits were available. 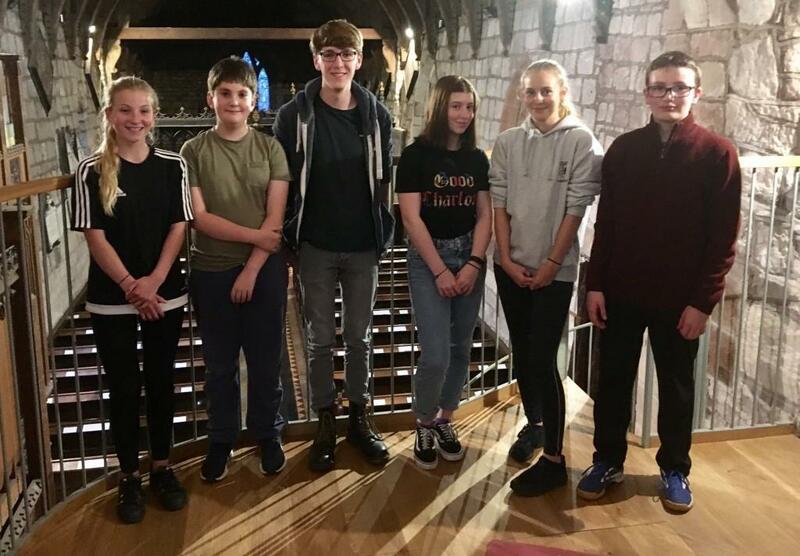 Matt reported that the Committee had discussed the question of the Carol Service, which had been raised at the January quarterly meeting, and had decided that the 2019 Carol Service would go ahead as planned; the committee would investigate the possibility of combining the Association Carol Service with another Carol Service. Trevor Lock (Beckbury), Jonathan Hales-Povey (Calverhall), and Octavia Hilton (Market Drayton) were elected as members of the Association. The Treasurer, David Beckwith, gave a brief report on the state of the Association’s finances. The major expenses so far this year have been the report printing, and the insurance. Geoff Harding raised £30 for the Bell Restoration Fund by running a raffle. The prizes of wine, and chocolates were won by Gill, Jad, and Mark. Gill Glover reported that there are currently 108 members of the 100+ Club, representing a high proportion of the active towers in the Association. Thanks to all the members for their support. The next draw will take place at the July Quarterly meeting. Thanks to David Cartwright and Mark Hayball for their hospitality. The next Quarterly meeting will be held at Peter Woollam’s home, featuring the Lichfield Mobile Diocesan Belfry. More details of this will be available closer to the time. The next Association practice will be held at Stanton-upon-Hine Heath on Saturday 11th May, from 7pm to 9pm. All ringers are welcome. 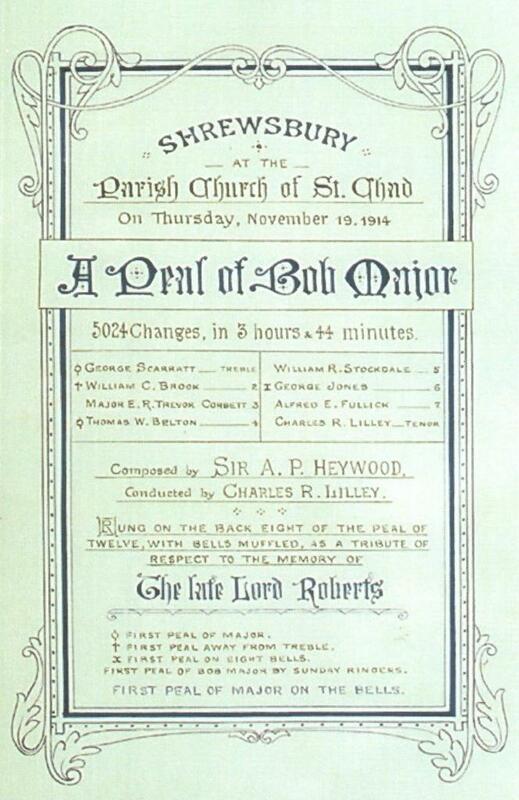 Once again the 8-bell practice was held at Hodnet. Twelve ringers practised (with varying degrees of success) call changes, Grandsire Triples, Plain Bob Triples, Stedman Triples, and St Clement’s College Bob Major. The towers represented included Atcham, Calverhall, Edgmond, Hodnet, Market Drayton, Meole Brace, Oswestry, Shrewsbury, and Tong. Thanks to John Powell for allowing the use of the bells. 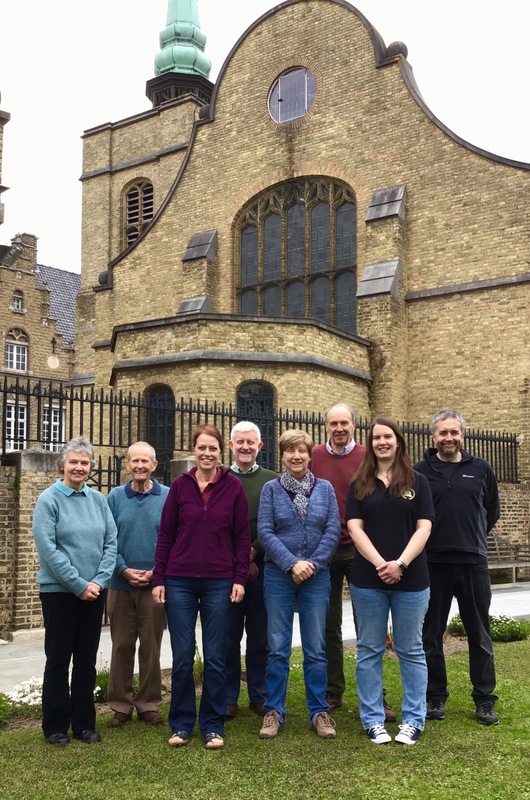 The fifth Association peal of 2019 was rung in Belgium, at the church of St George, Ypres. Conducted by Nicholas J Green. 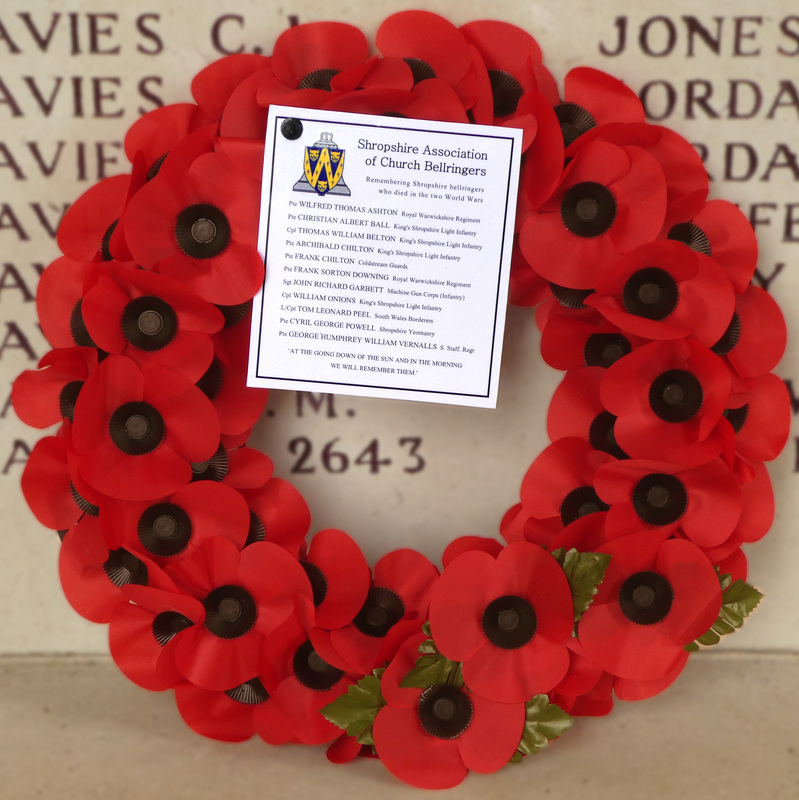 Remembering those Shropshire ringers who gave their lives in the two World Wars. Last Post Ceremony at the Menin Gate. L to R: MJH, WSD, GKL, PJL, GRG, NJG, CAD, ML. It is also essential to follow up quickly any potential recruits. Consider working with other towers to teach bell handling. Studies show that intensive training (eg an hour a day every day for a week) leads to better retention of new recruits. Be welcoming of new recruits – first impressions matter. Take part in an ART course to learn to teach bell handling. The Learning the Ropes scheme offered by the Association of Ringing Teachers (ART) is a learning scheme for new ringers and provides a structured approach to developing ringing skills. ART recruitment resources can be found at ringingteachers.org/resource-centre/recruitment-and-retention. Contact Matt Lawrence  if you would like help with recruitment and training. The fourth Association peal of 2019 was rung at Clive. Conducted by Andrew W Gordon. Rung to welcome the new vicar, The Rev Paul Cawthorne, to the parish of Clive. John Neal (Shrewsbury) has enthusiastically organised the Association's biennial Outing, which will take place on Saturday 8th June. All ringers are invited to attend. 12:45 - 14:15: Picnic Lunch, bring your own, in the grounds of Pershore Abbey; use Abbey Park car park, WR10 1JP. There are plenty of pubs and restaurants to choose from, if the weather is poor. 15:30 - 16:45: Upton Snodsbury (6), WR7 4PB . The ladies of the village have offered to provide Afternoon Tea and Cake. Booking is required. Please let Matt Lawrence  know if you want to take advantage of this offer. Mystery tower of the day - to be announced at Upton Snodsbury. A pdf poster can be found here. The article below, abridged from Teddy Rodenhurst's reminiscences published in The Ringing World of 22nd May 1962, supplies some details. A ringer of some note locally, with whom I rang prior to WWI and subsequently, was Mr E R Trevor Corbett (afterwards 'Major'), whose father owned a large estate at Longnor, some eight miles south of Shrewsbury. He was a tall gentleman and the only ringer I have seen at meetings wearing spats, as he sometimes did. The little church at Longnor having only two bells, he came to take up ringing in the following manner. 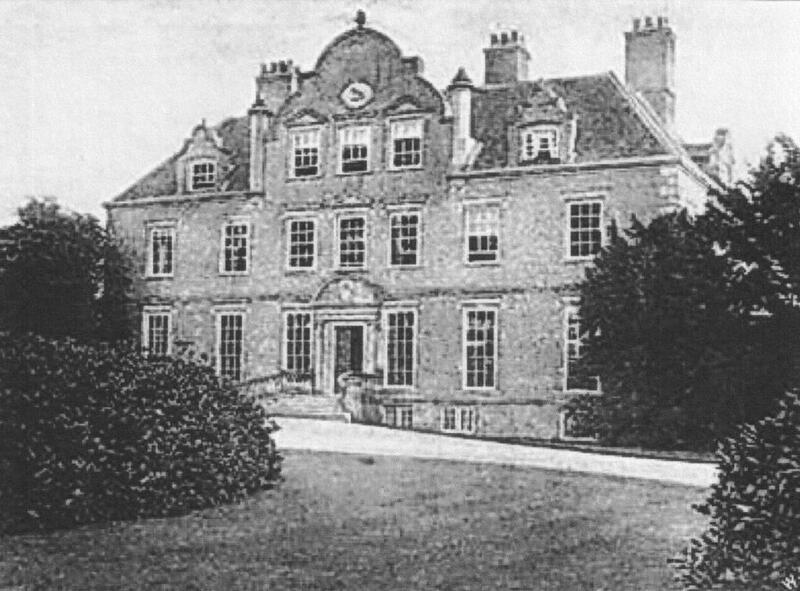 George J Taylor, one of George Byolin's band at St Alkmund's, Shrewsbury, and a conductor of several peals, was suffering from tuberculosis and lived for a time in a chalet on Lyth Hill. When there he used to go down to Condover to instruct the ringers and managed to teach them to ring Grandsire from the call changes to which they had been used. One evening Mr Corbett happened to be in the neighbourhood of the church and looked in to watch the ringers. He became interested and expressed a wish to learn and was taught by George Taylor. Later on he used to motor-cycle to St Alkmund's, Shrewsbury for the practices and on Sunday evenings, and learnt to ring Stedman Triples. 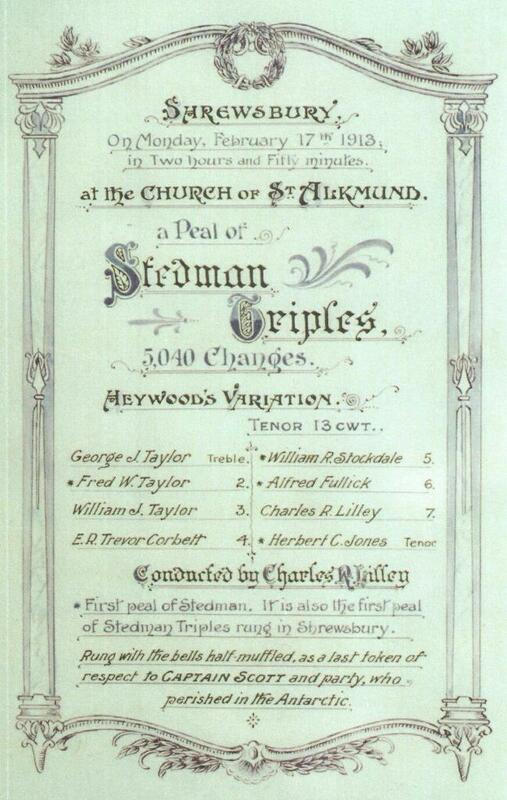 For his first peal of Stedman Triples he travelled to Birmingham - I suppose he thought there was nothing like making as sure of it as possible - and he rang the fourth in the last peal (Stedman) on the bells of St Alkmund's, called by C R Lilley. It was through Mr Corbett that Lilley came to Shrewsbury as instructor. He (Lilley) was out of a job at the time and advertised in the ringing press. He was a joiner and cabinet maker (an excellent tradesman as I saw from some of his work. He made himself a fine roll-top desk and when the old bells were pulled out of St Chad's he made pipe racks for the churchwardens out of some of the old oak.) Mr Corbett was able to get him taken on as estate carpenter on the Longnor Estate and the work he did for ringing in the area is, I think, too well known for me to relate here. 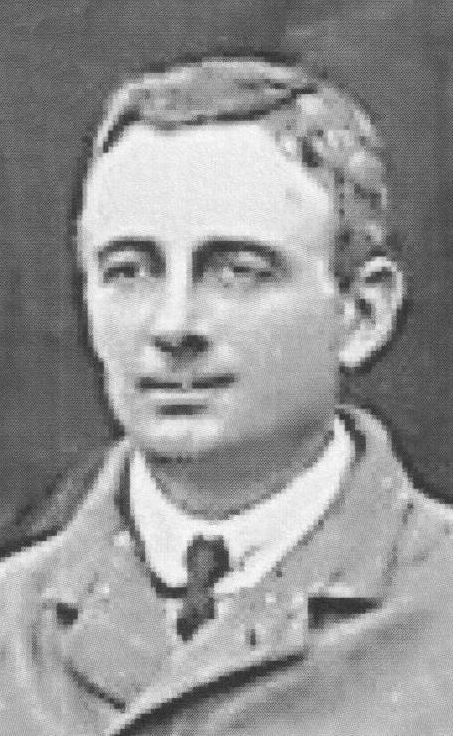 On the outbreak of hostilities Mr Corbett got a clerical job in Shrewsbury connected with the military (in the KSLI) and attained the rank of major. He continued his ringing at St Chad's and rang the third in the first peal on the recast bells. This may have been the last peal Major Corbett rang, though he came to the meetings from time to time. For one thing he was a very busy man. His father having died, he had the estate to supervise and he was also on a large number of public bodies. He was interested in the Shropshire and West Midland Agricultural Show and the Shrewsbury Flower Show. He was a magistrate and also, I believe, a county councillor. When the Guild was reformed on a county basis in 1926 he was elected Master and took the chair at the annual meetings. The last time I saw him was on a meeting day, sitting in a wheel chair outside St Chad's Church, completely crippled with arthritis and his hands like chalk. It was not so very long after that he died. Fifteen ringers attended the Association practice at Forton, the Shropshire Association tower in Staffordshire. Under the direction of Matt Lawrence, Ringing Master, attempts were made at plain hunt on five, Plain Bob Doubles, Plain Bob Minor, Plain & Little Minor, Kent Treble Bob Minor, Cambridge Surprise Minor, Cambridge/Beverley/Surfleet Surprise Minor, and Norwich Surprise Minor. Peter Woollam ran a raffle, no surprise there, raising £22 for the Bell Restoration Fund. The prizes of wine, something smelly, and coffee were taken home by Lisa, Edric, and Janet. Thanks to Peter Cadwaladr and Janet Guest for their hospitality and for providing hot drinks and biscuits. The next Association practice will be held at St Martins on Saturday 13th April, from 7pm to 8:30pm and will be followed by the Quarterly Meeting. All ringers are welcome. The third Association peal of 2019 was rung at Morville. In 2018 the Shropshire Association's 100+ Club continued the trend of recent years with more than 100 members. There were twenty winners and the total prize money awarded was £468, with £784.98 being raised for the Bell Restoration Fund. 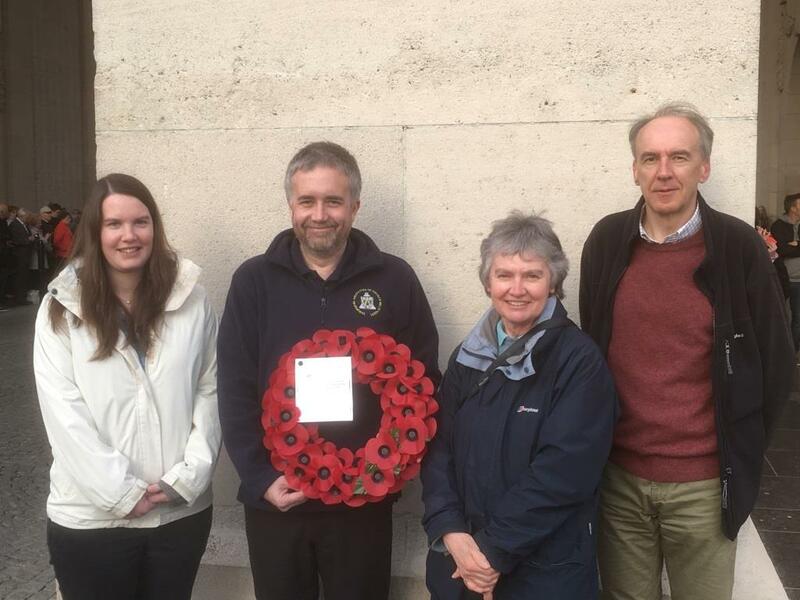 Five grants totalling £1988.97 were awarded from the Bell Restoration Fund in 2018. Your support of the 100+ Club will help the Bell Restoration Fund grow and ultimately increase the size of the grants awarded for bell restoration projects within the Shropshire Association. Gill Glover, who has taken over from Brian Kear as the organiser of the 100+ Club, has started distributing application forms for 2019 to tower correspondents; look out for the forms at your tower or at the Association practice on Saturday 9th March at Forton. To be a member of the Club you must be over the age of 16 years. More members means more and/or better prizes. To be in with a chance to be a winner, please return your completed application form and cheque for £12 to Gill at the address given on the application form. Cheques should be made payable to SACBR	Bell Restoration Fund. The first draw of the year will take place at the Quarterly Meeting at St Martins on 13th April. Congratulations to Nathaniel Carter and Alicia Jones who have rung their first quarter peal at Wellington. We can now offer members a range of items embroidered with the SACBR logo. These are embroidered to order: contact Biff Patterson [ ] for details or to place an order. The background colour for ‘corporate’ events is burgundy (as shown) but feel free to choose a different background for personal use. Check availability but navy or black are obvious options. 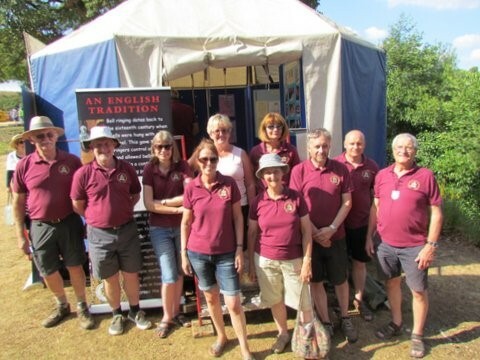 Polo shirts, as worn by those manning the Lichfield Diocesan Mobile Belfry at Newport Show, £15. Biff has one lady-fit medium in stock. If you would normally buy small, this is for you. Sweat shirts £17.50 Rugby shirts £25. If you supply a garment it can be embroidered for a cost of £6. The polo shirts are pure cotton, wash very well, BUT are skimpy. Biff suggests going up one or even two sizes on what you would normally select. Available in standard rectangular shape (men or unisex), quite long in the body; or lady-fit, which is shorter and more shaped. Choose from M, L, XL, XXL, XXXL. Sweat shirts are only available unisex: S, M, L, XL, XXL, XXXL. Rugby shirts are available in men’s or women’s: S, M, L, XL, XXL, XXXL. The Central Council of Church Bell Ringers (CCCBR) has produced an update to Guidance Note 3 (GN3) - Child Protection in Bell Towers. This Guidance Note can be found at https://cccbr.org.uk/wp-content/uploads/2017/10/GN3-Child-Protection-Issue-12-Oct-2017.pdf. The Appendix to the Guidance Note describes in more detail the ringing activities which require a ringer to be DBS checked. Are you looking for some practical, written help for yourself or your tower but don’t know what is out there? If so, Books for Bellringers may be what you need. It is a small collection of books aimed mostly at beginners but with some material for those learning methods. Towers can borrow the collection for a period of up to two months so that everyone has a chance to see what they might find useful. Individuals or towers can order copies of the books using the details in the catalogue supplied. If you would like to borrow the collection please contact me at: or telephone 01939 291014. Do you have young ringers at your tower? We have started a youth group designed to get the young people ringing together and help them to progress. There have been three practices so far, attended by six ringers from different towers across the Association area and we hope to have a regular monthly practice going forward. The leader is ART (Association of Ringing Teachers) trained and DBS cleared and can offer instruction in bell handling through to ringing call changes, plain hunting, methods and striking. The aim is to encourage the next generation of ringers and recruit more young people to the exercise. The Towers and Belfries Committee of the Central Council has produced some guidance notes on the various ways we access towers. The notes cover the condition of stairs and ladders; handholds; lighting; doorways and trap doors; and some potential hazards. Would you like to ring a Peal? Andrew Gordon is offering to make arrangements and co-ordinate towers and ringers for Peal attempts. Please contact Andrew on 07973 398289. In order to ensure that all ringers have the opportunity to read the quarterly Newsletter, and to help keep costs down, it would be helpful if the Newsletter could be delivered electronically. Is there someone in your tower who would be willing to receive the quarterly Newsletter by email, and be willing to make at least one copy of it for your tower notice-board? This person should be someone who checks their email frequently (not just once or twice a year!). 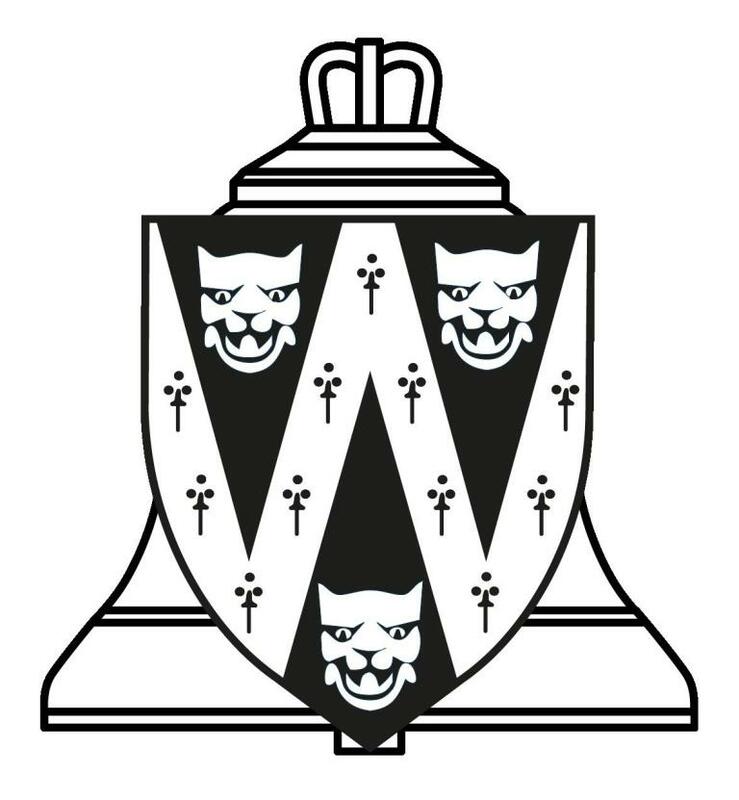 Please contact Peter Woollam [ ] with the name, email address, and tower of your tower’s email correspondent and of any other members who would like to receive their own copy. Email addresses supplied will be stored on the Newsletter Editor's computer and used only for the distribution of the newsletter. They will not be made available to anyone else. Paper copies will still be sent out to those towers who do not wish to receive it electronically. These practices are usually held on the last Friday of the month and at various locations. The practices are not only aimed at members who want to progress in their Surprise Major ringing, but at those who feel they are capable of starting their Surprise Major ringing career. Those who aspire only to ring the treble may attend, but clearly they may not get much of a ring - there is only one treble in each touch. We rely on the experience of more seasoned Surprise Major ringers to strengthen bands; the ringing master is grateful for their support. The practices will as far as possible be tailored to the needs of those attending. There will be one or two 'special' methods - probably one of the 'standard eight' plus something of the Ringing Master's choosing. The 'easier' methods of the standard eight will also be rung e.g. Cambridge and Yorkshire. Please let the ringing master know of any special request. On the first Monday evening of the month there will normally be an opportunity for individuals to have a one to one session on a silenced bell with the simulator. The session will be limited to three people, so ring Edric Broom (01952 825851) as early as possible to book your place. If you have a training requirement which you feel is not being met, and which perhaps could be met with input from the Association, please discuss it with the Association's Training Officer, Tony Freemont, so that we can try to satisfy the need, either in your tower or at the Edgmond Ringing Centre. The next Association committee meeting will be held on Sunday, 10 March 2019. Peter Woollam is Editor of the printed Newsletter as part of his Publicity portfolio. He would welcome any comments on the future format of the Newsletter and any items for inclusion in it.